With the sides level at the break, Kilkerrin/Clonberne faced an uphill task playing into a strong breeze but second half goals from Annette Clarke, Galway’s 2004 All-Ireland winning skipper, and current county star Louise Ward set them on the path to victory. Olivia Divily added a free for Kilkerrin/Clonberne but it was Carnacon who would finish the half the stronger of the two sides with points into the wind coming from Staunton and Louise Dowling. Despite the aid of the wind, Carnacon found their opponents difficult to break down and Kilkerrin/Clonberne crowded out the attack time and again to frustrate. They could do little to halt Cora Staunton at times in the second period, however, as she hit five second half points – the majority from distance. Goals win games however, and Kilkerrin/Clonberne’s work rate was matched by their ability to create a goal chance from nowhere. After Carnacon regained the lead, Louise Ward hit a curling effort toward the posts that dropped into the corner of the net to leave Kilkerrin/Clonberne a point ahead entering injury time. Scorers – Carnacon – C Staunton 1-7 (1-0pen, 0-1f), L Dowling 0-1. Kilkerrin/Clonberne – A Morrissey 1-1, L Ward 1-0, A Clarke 1-0, O Divily 0-1f, C Dunleavy 0-1, C Miskell 0-1. 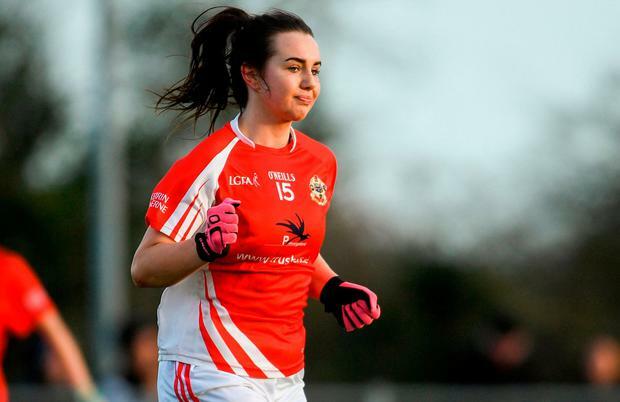 Kilkerrin/Clonberne – L Murphy, A Costello, S Gormally, C Costello; S Fahy, L Gannon, H Noone; S Divilly, C Miskell; L Noone, L Ward, O Divilly; E Noone, A Clarke, A Morrissey. Scorers for Donaghmoyne - C McConnell (0-9, 3f), E Traynor (1-0), S Courtney (0-1), L Garland (0-1), L Kerley (0-1), H Kingham (0-1), C Courtney (0-1), R Courtney (0-1).